At Noon on Wednesday 29 October, the Choir of Liverpool Cathedral under the direction of David Poulter will offer a program of choral music in Grace Church. With the foundation of the Diocese of Liverpool in 1880 the Parish Church of Saint Peter became the first Cathedral of the new Diocese, and so the Cathedral Choir was founded. 1904 marked the beginning of work on Giles Gilbert Scott’s great new Cathedral and in 1910 the first portion, the Lady Chapel, came into full use. From this date regular choral services in the new Cathedral, sung by a choir of boys and gentlemen, began. They sustained daily worship in the Cathedral Lady Chapel for the next fourteen years, after which Choral services were able to take place in the newly completed first bay of the main Cathedral in 1924, Daily choral services were maintained until the outbreak of the second world war, at which time the number of choral services was reduced. The pattern of choral services six days a week was re-established with the boys and layclerks singing each day apart from Wednesday. In September 2003, to mark the centenary of Scott’s Cathedral in 2004, the Girls Choir was founded. Between them the boys, girls and layclerks of the Cathedral Choir sing seven regular choral services a week. The choir’s prime function is to maintain choral worship during the thirty-eight weeks of term time. There is no dedicated choir school and the boys and girls of the Cathedral Choir attend different schools across the city and diocese. The choir also sings at numerous special services and concerts, and makes broadcasts and recordings. Membership over the years has included some 2000 boys, and a growing number of girls, many of whom have gone on to eminent musical careers. The choir has worked with many famous musicians, including former Beatle, Sir Paul McCartney, who despite having failed his audition for the choir in the 1950s. 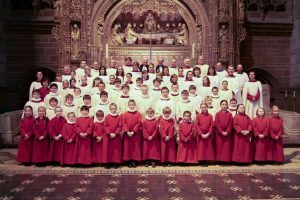 returned to the Cathedral to collaborate with with the choir several times, most notably in performances of the ‘Liverpool Oratorio’ and ‘Ecce Cor Meum’. DAVID POULTER was born in Kent and educated at The Kings School, Rochester and at The Royal College of Music, London where he was a Foundation Scholar andWalford Davies prizewinner. He was also awarded the coveted Limpus and Frederick Shinn prizes at the Royal College of Organists. He is a Graduate of the Royal Schools of Music and he holds the organ and choir training diplomas of The Royal College of Organists, The Royal College of Music and Trinity College of Music. He was awarded an Honorary Fellowship of the Guild of Church Musicians in 2008. After five years as Assistant Organist at Rochester Cathedral, further study at London University, and some years teaching at Cranbrook School and Tunbridge Wells Girls’ Grammar School as Head of Music, David Poulter went to Coventry Cathedral in 1990, first as Assistant Organist and ultimately as Director of Music. During his time in Coventry, he founded the Cathedral Girls’Choir consisting of 50 singers aged 8 – 16 years. He also initiated a course in Church Music at Coventry University. David Poulter was appointed Organist and Director of Music at Chester Cathedral in April 1997, following a succession of distinguished organists dating from Robert Whyte in the 16thcentury to John Sanders and Roger Fisher in the 20th century. Under his direction, the Cathedral Choir undertook seven CD recordings, many broadcasts on BBC Radio and TV and Granada TV, and premiered many new works written especially for Chester Cathedral, including one by John Tavener. The choir also enjoyed tours to France, Holland, Ireland and the USA. David was actively involved in the planning and raising of £1.6 million for the building of a new Song School in 2005. Other highlights during his years in Chester were two International Church Music Festivals with Sir David Willcocks. In 2007, he led a community project entitled Singing Out Loud, resulting in over 200 school children joining with the cathedral choir in performances of a specially commissioned work celebrating the life of St Werburgh. During this period, David Poulter was also a regular conductor of the BBC Daily Service. In January 2008 David Poulter was appointed Director of Music at Liverpool Cathedral. As part of the city’s year as Capital of Culture, there were three BBC Radio broadcasts featuring the Cathedral Choir, including the Holocaust Memorial service in January, and two broadcasts on Easter Day. Other highlights included two performances of Britten’s War Requiem in Cologne, a performance of Paul McCartney’sEcce cor meum, and the first performance of a specially commissioned carol I sing of a maiden by the Liverpool-born composer, John McCabe. The cathedral choir undertook a tours to Poland in 2009, Paris in 2010, Estonia in 2012 and New York and Washington in 2014. David Poulter has travelled extensively, as a recitalist, and as a conductor to France, Germany, Holland, Italy, Norway, Poland, Jamaica and the United States. He will be playing and conducting in Texas in September this year. He has featured as a soloist on BBC Radio 3 with the BBC Philharmonic Orchestra, and his solo organ CD recordings include Fanfare for Organ (Mayhew 1995), Toccatas from Coventry (Lammus 1998) and Organ Music from Chester (English Cathedral Series, volume 5, Regent Records 2002).